A Molecule of Carbon Dioxide from NASA's Climate Science Investigations page. Ocean Acidification is a problem that is rooted in a very complex, but very important cycle, known as The Carbon Cycle. The Carbon Cycle describes the fantastic journey of the element Carbon as it travels and becomes stored in the atmosphere, the earth and all living organisms on the planet. But how does Carbon cycle, you ask? And how does this cycle relate to Ocean Acidification? This great little video from Make Me Genius explains the Carbon Cycle for learners at any age, and traces Carbons path as it moves through our world and into the ocean! Did you like that video? Would you like to test for understanding with your class? Check out the video question handout! 1. Carbon and carbon dioxide are fundamental to life on earth. Carbon is constantly cycled, from the atmosphere, to living trees, animals and people, and even into the earth itself. 2. When humans and animals breathe, or petroleum products are burned, Carbon Dioxide (C02) is created and released. During combustion or burning, carbon from fossil fuels combine with oxygen in the air to form carbon dioxide and water vapor and are released into the atmosphere as a byproduct. Carbon Dioxide is absorbed by trees and used in photosynthesis, and is also absorbed into water. Carbon is also stored in soil, as well as deep within the earth as a part of minerals. 5. Over the last 250 years, 550 billion tons of Carbon dioxide have been absorbed by the Ocean. 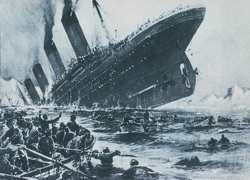 That's the equivalent of absorbing about the mass of 10,514 ships the size of the Titanic! 6. 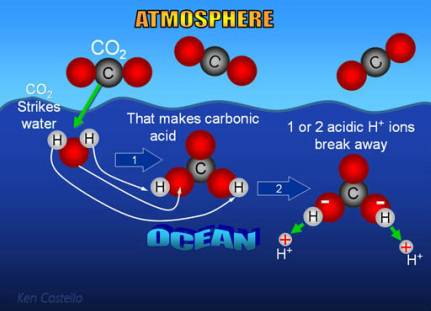 Dissolved Carbon Dioxide reacts with seawater to create a substance known as Carbonic Acid. Carbonic Acid reacts with other molecules, like Calcium Carbide (CaC03) found in seawater, and releases Hydrogen ions, effectively decreasing the pH of the surrounding seawater. To learn the details of the chemical reactions between seawater, carbon dioxide and other elements in the ocean like Calcium Carbide, click here. 7. Increased acidity reduces carbonate -- the mineral used to form the shells and skeletons of many shellfish and corals. Having less calcium available for ocean organisms slows their growth and makes their shells weaker. 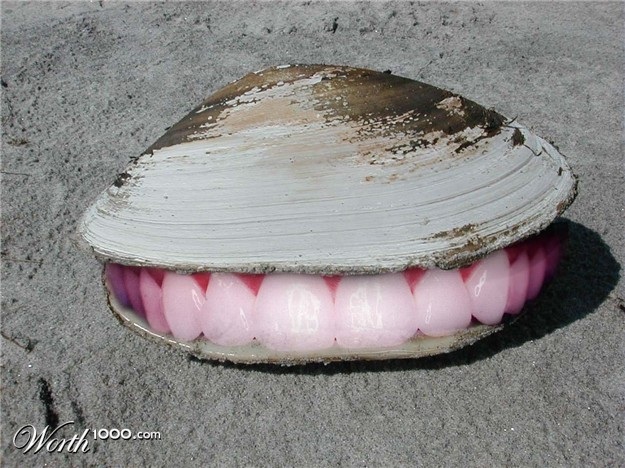 If pH levels drop enough, the shells will literally dissolve. NOAA photo of a pteropod shell dissolving in acidic ocean water. 9. Without healthy shells, many important invertebrate species will be unable to support and protect themselves. If these organisms disappear, their predators will go hungry, putting a strain on the already damaged marine food web. This means less food for marine species, and therefore, less healthy seafood for us, too. Acidification can also damage many species that create safe ocean habitats, like coral reefs. Without their protection, many important fish species may be without a safe place to grow, raise their young, and be protected from predators! In the long term, the loss of reef systems and shelled invertebrates could lead to large scale economic loss to all nations that rely on seafood as a source of food and income. 10. By the end of this century, the surface waters of the ocean could be nearly 150 percent more acidic, resulting in a pH that the oceans haven’t experienced for more than 20 million years. It's possible that by the year 2050, the ocean water near the North and South poles will be severely corrosive, and organisms with shells may be unable to inhabit these areas altogether (NRDC). So what can you do about Ocean Acidification? The best way to target the problem is to understand where it's coming from. If we can reduce our carbon emissions from burning fossil fuel, we can also reduce the rate at which the ocean becomes acidified. This is a very difficult challenge, but one that must be tackled in our homes, work places, and governmental policies. The Coral Reef Alliance suggests that to make a difference, we need to enact tougher carbon dioxide emission legislations. Click here to read how they believe you can create change most effectively. Ryan Kelly and Margaret Cadwell recently published an excellent article about how to use legal and policy tools to combat ocean acidification. The article, entitled "Ten ways states can Combat Ocean Acidification, (and Why they Should)" is published in the Harvard Environmental Law Review. Basically, it's up to us to fight Ocean Acidification! Time to work together to create real solutions!